The Nevada State Athletic Commission (NSAC) has set a date for a hearing regarding the UFC 229 brawl. As most mixed martial arts (MMA) fans know, a huge brawl broke out following the main event of UFC 229 this past weekend (Sat. October 6, 2018). Khabib Nurmagomedov defeated Conor McGregor via fourth-round submission. 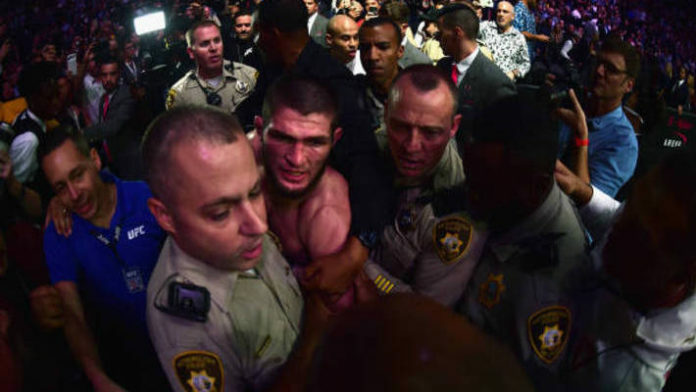 After the fight, Khabib jumped the Octagon and attacked McGregor cornerman Dillon Danis, who had been antagonizing “The Eagle.” As they engaged in a brawl outside the cage, a few Team Khabib members entered the Octagon and attacked McGregor. Thankfully, event security was soon able to get the matter under control. “I just spoke to NSAC executive director Bob Bennett who told me that they will be in fact temporarily suspended for 10 days come October 15. Per their rules, you can only be temporarily suspended for 10 days. “The next Nevada Athletic Commission hearing is on October 24, that’s when the chairman of the NAC and the rest of the commissioners will vote whether or not they will be indefinitely suspended pending their investigation, which has already begun. “He says as of right now, Khabib has yet to be paid his purse, not one cent of his $2 million purse. Conor was paid but he declined to say why Conor was paid and Khabib wasn’t. And he declined to give me a ballpark of a full suspension or fine that they would receive. What do you think will come of the NSAC’s hearing?